Filters Factory Gallery and VM Toolbox can be used alone or imported into Filters Unlimited. 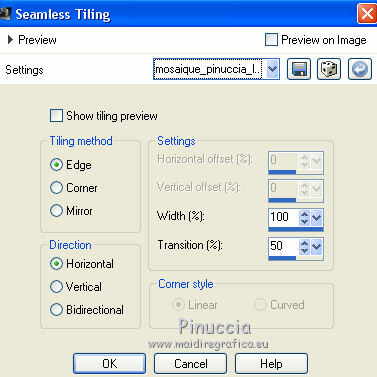 Copy the preset SeamlessTiling_mosaique_pinuccia_lulu in the Presets Folder. and your background color to #8b92ae. 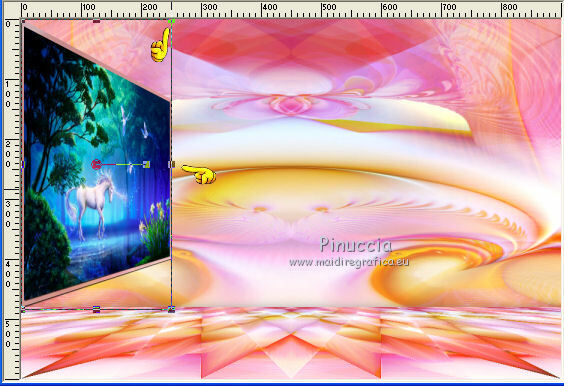 Open the fractal "display 1902364" - Edit>Copy. 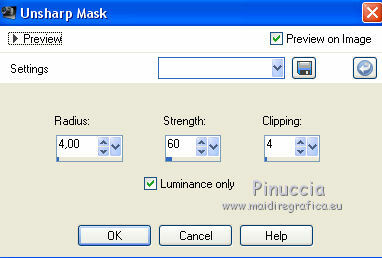 Select the preset mosaïque_Pinuccia and ok.
Effects>3D Effects>Drop Shadow, background color (color 2). 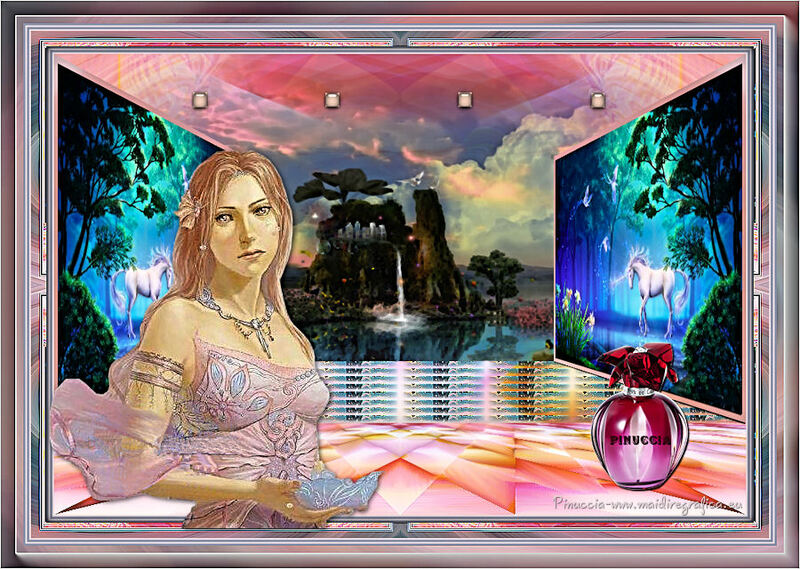 The selection Alpha_Pinuccia_1 is immediately available. You just have to click Load. Edit>Paste into Selection (the fractal "display" is still in memory). 5. Selections>Modify>Contract - 10 pixels. Open the tube Féerique and go to Edit>Copy. push the central right node to the left until 250 pixels. 7. Activate the layer below "Copy of Raster 1". Load again the selection Alpha_Pinuccia 1. Open the tube Calguismistfantasia and go to Edit>Copy. 8. Activate the bottom layer (Raster 1). Go back to your work and activate the layer Raster 3. 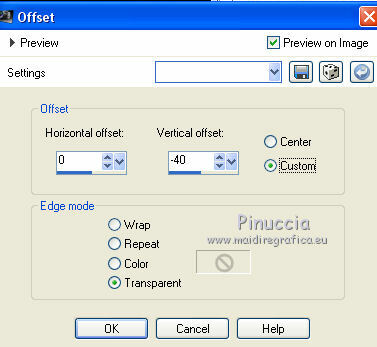 Open the selections menu and load Alpha_Pinuccia 3. 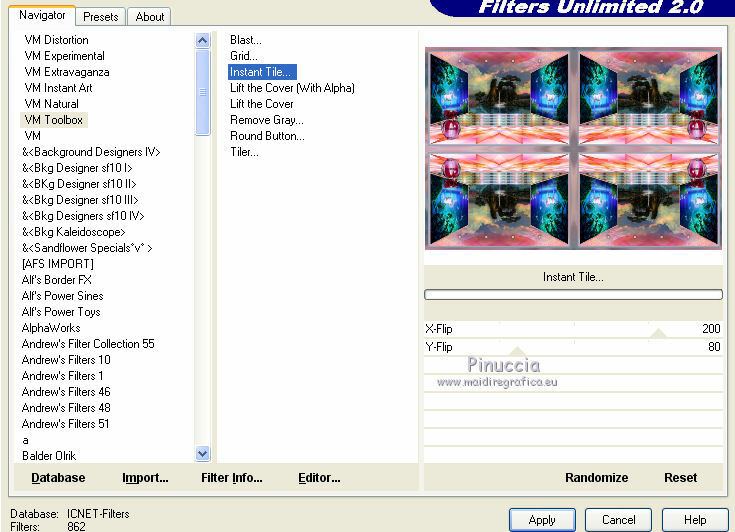 Effects>Plugins>Filters Unlimited 2.0 - Filter Factory Gallery S - Fractal Tiler. 9. 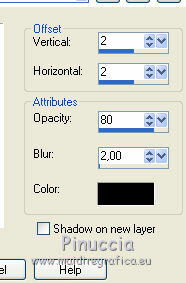 Image>Add borders, 2 pixels, symmetric, foreground color #e2d4d8. 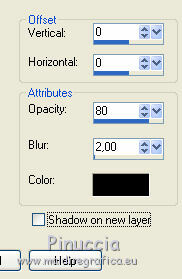 Image>Add borders, 3 pixels, symmetric, background color #8b92ae. Image>Add borders, 2 pixels, symmetric, foreground color #e2d4d8. 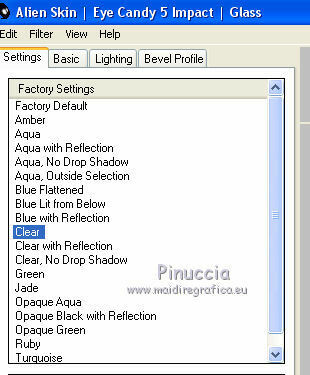 Open the selections menu and load Alpha_Pinuccia 2. Set your foreground color to #f7d0bc (color 3). Flood Fill the selection with your foreground color #f7d0bc. Effects>Plugins>Alien Skin Eye Candy 5 Impact - Glass. Select the preset Clear and ok.
11. 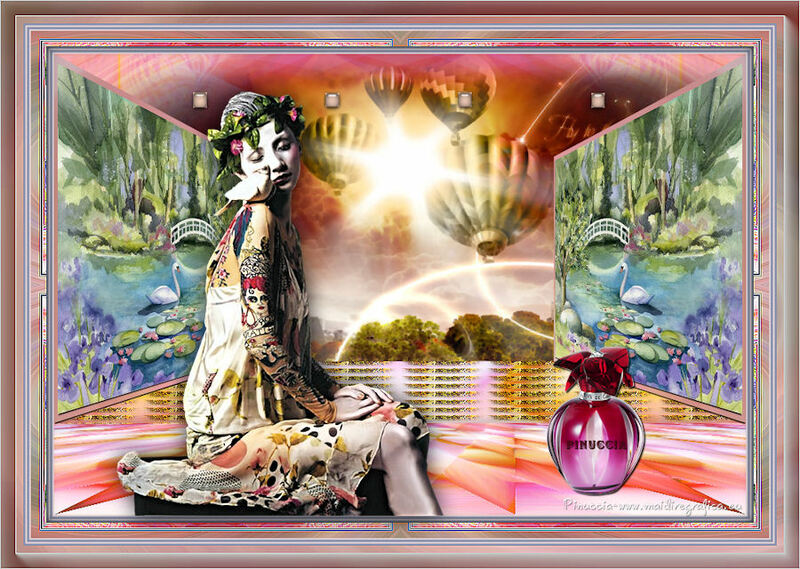 Open the tube parfum Pinuccia and go to Edit>Copy. Image>Add borders, 20 pixels, symmetric, foreground color #f7d0bc (color 3). Activate the image minimized at step 8 - Edit>Copy. 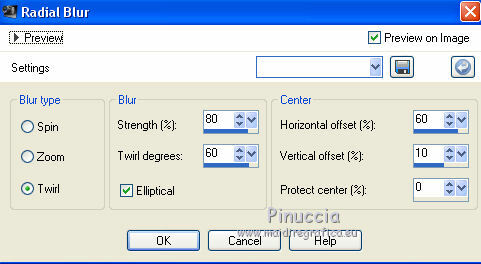 Effects>Plugins>Filters Unlimited 2.0 - VM Toolbox - Instant Tile. 13. Open the tube of the woman and go to Edit>Copy. Move the tube to the left side (see my example). Image>Add borders, 2 pixels, symmetric, color 1 #e2d4d8. 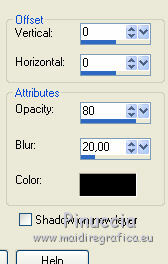 Image>Add borders, 3 pixels, symmetric, background color (color 2) #8b92ae. 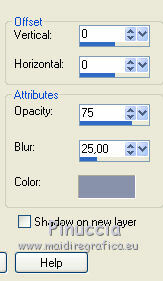 Image>Add borders, 30 pixels, symmetric, foreground color (color 3) #f7d0bc. Activate again the image minimized at step 8 - Edit>Copy.